Amino1 is the ultimate daily performance supplement with benefits for hydration, recovery, muscle fuel, and cellular energy. Specifically, Amino1 features ingredients such as Arginine Alpha-Keto Glutarate (AAKG), which helps to produce nitric oxide (N.O.) and widen the blood vessels to increase blood flow and nutrient delivery to the muscles. Secondly within the Cellular Energy & ATP Fueler blend, Amino1 Sport contains Taurine, the electrolyte regulator, ensuring a proper balance of these electrolytes is delivered to the muscle. The recognizable blend for this formula is the patented BCAA 3:1:2™ complex. The BCAA 3:1:2™ ratio takes 3 grams Leucine, 1 gram Isoleucine and 2 grams Valine. Leucine, the most dominant and fastest absorbing, not only breaks down into usable glucose, like isoleucine and valine, for the muscle, but also stimulates the release of Insulin, jumpstarting the anabolic process. The Recovery Matrix offers L-Glutamine, the most abundant amino acid there is, and responsible for repairing damaged muscle, L-Glutamine serves an excellent complement to the BCAA’s as it is delivered to the muscle at the time when it is most needed: during anabolism. Also within the recovery matrix are L-Alanine, beneficial for utilizing blood sugar as energy, and L-Glycine, which fights muscle degradation by boosting the body’s natural supply of creatine, as well as help deliver glucose to the muscle. 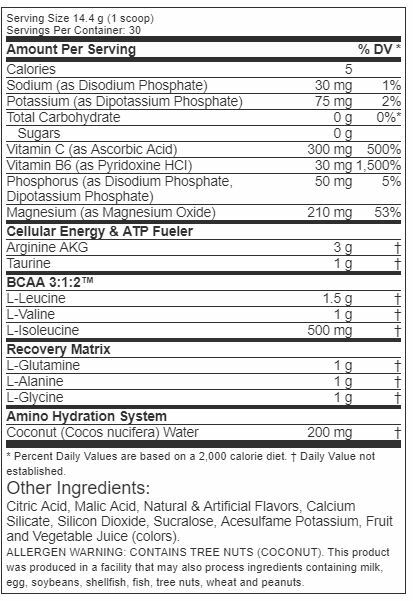 Lastly, Amino1 Sport features the Hydration system of Coconut Water Extract which naturally provides electrolytes like sodium, potassium, magnesium, and phosphorous to hydrate the muscles to prevent muscle breakdown, dehydration and cramping.